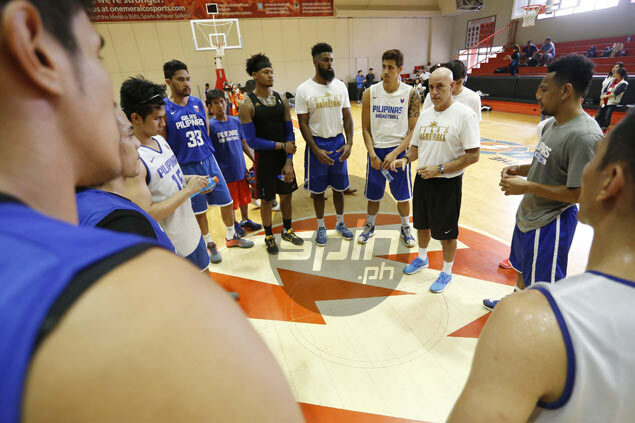 GILAS Pilipinas' training for the Olympic Qualifying Tournament (OQT) is about to shift into high gear with a three-week trip that will bring the national team to Greece, Turkey, and Italy. The national squad resumed practice on Wednesday at the Meralco gym, and is considering making the grind a daily one by next week. Coach Tab Baldwin said Gilas will be in the country until June 10, after which it embarks on a European trip starting with a nine-day training in Greece. "We will be going up to the mountain and go to a training center there where usually the great national teams train in a place called Kapernici," said Baldwin after the team concluded its three-hour training following more than a month of rest to give way to the PBA Commissioner's Cup playoffs. From Greece, Gilas will go straight to Turkey to play the Turkish national team. "We'll have a couple of days in Istanbul," said the 57-year-old Baldwin. Then its off to Bologna, Italy where Gilas will participate in a pocket tournament along with Canada, China, and the host country. "We play Italy on Day 1 as it stands now. And then winners vs.winners and losers vs losers on Day2. Then we fly home I think," said the Gilas coach. On July 1, the Philippine team plays Turkey again here in Manila, winds down its training, and finally gets down to businss with a game against France at the start of the qualifier on July 5 at the Mall of Asia Arena.